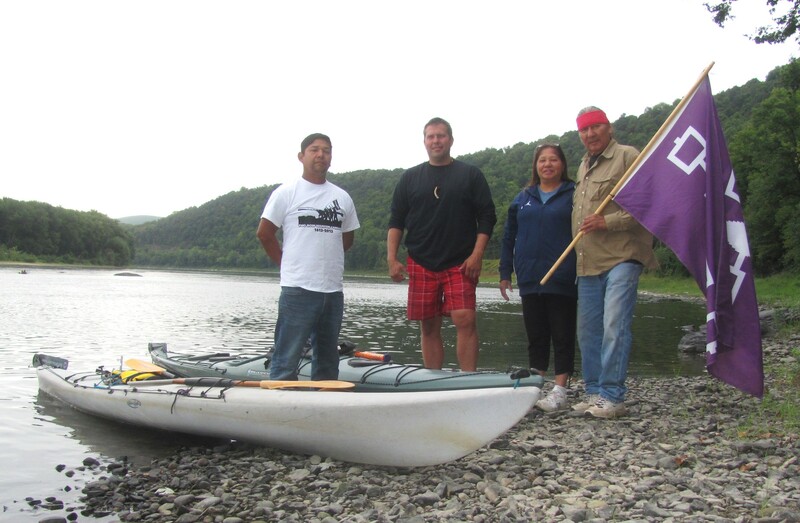 Onondaga Canoe and Kayak Club members (from left) Hickory Edwards and Noah Onheda are paddling down the Susquehanna River with Hickory’s parents, Viola and Rick Edwards (right) serving as their land support crew. They camped south of Tunkhannock on Tuesday evening as part of a sojourn to Washington, DC for the opening of an exhibit celebrating more than 400 years of treaties between the government of the United States and the nations of Native Americans. Two paddlers on the water and two people driving a van parallel to the Susquehanna River may not seem like much of an entourage, but the message they carry and their reasons for a 20-day journey from Onondaga Lake in New York to Washington, DC figuratively carry more weigh than their combined gear and apparatus. Onondaga Canoe and Kayak Club paddling coordinator Hickory Edwards and river companion Noah Onheda left Cortland, NY on Sept. 2 for a historic sojourn to see through the eyes of their ancestors and to honor their legacy upon reaching the National Museum of the American Indian. “You govern your people. We’ll govern our people,” said Edwards, citing the basic tenants of a treaty between the Five Nation Iroquois confederacy and the Dutch government when the white settlers expanded their interests beyond Manhattan Island. While many agreements made between the Europeans, US and Canadian Governments and Native Americans have been broken, the Two Row Wampum is one of some 200 treaties still honored by the US government that are the focus of an exhibit that will open on September 20 at the museum in Washington, DC. The exhibit – Nation to Nation – will run for two years at the museum’s flagship headquarters on the National Mall. “We’re coming from our capitol to yours,” Edwards told two representatives of the Endless Mountains Heritage Region (EMHR) who caught up with his group on the morning of Sept. 10. Onondaga Lake is considered by many of the (now) Six Nation people as the cradle of their history on this continent. It was there that the legendary peacemaker Chief Hiawatha planted the Tree of Peace after forging a treaty that united the existing nations in the 12th or 13th centuries. The Tree of Peace was said to have sprouted four white roots of unity and strength, each pointing to a major trade route of the indigenous North Americans. In 2013, Edwards and other club members traveled waterways in New York state that are associated with three of those roots. This year, he set his sites on the Susquehanna River, which was historically the route from the Great Lakes via the Chenango River at modern day Binghamton, NY. The northern branch of the Susquehanna served as a trade route with southern tribes and eventually white settlers and was fiercely guarded south to the Wyoming Valley until federal troops under the command of Gen. John Sullivan forced all native Americans out of Pennsylvania and New York’s southern tier in 1779, killing many along the way. Two hundred fifty years later, the Two Row Treaty between the US Government and members of the Six Nations is constantly in jeopardy due to ongoing land encroachments and efforts by state and federal legislators to enact their laws on native people. Another goal of the expedition is to help preserve the culture of his native people by involving as many of them as possible in his journeys. He lamented that his 13-year old niece was not with him as usual, as she had to return to school. “We are free native people traveling on our own accord through our ancestral trails, and one of our ongoing goals is to relearn the waterways that have been forgotten by our people,” said Edwards. “They used to be common knowledge. We will pass them on. They will not be forgotten again.” His niece has already logged more than 1,000 miles on New York’s waterways. In Pennsylvania, Edwards and Onheda are enamored by the beauty of the Endless Mountains as seen from the river. “Every turn is a postcard picture,” Edwards remarked. He was also impressed by the amount of wildlife he saw at the river’s edge, including numerous bald eagles. 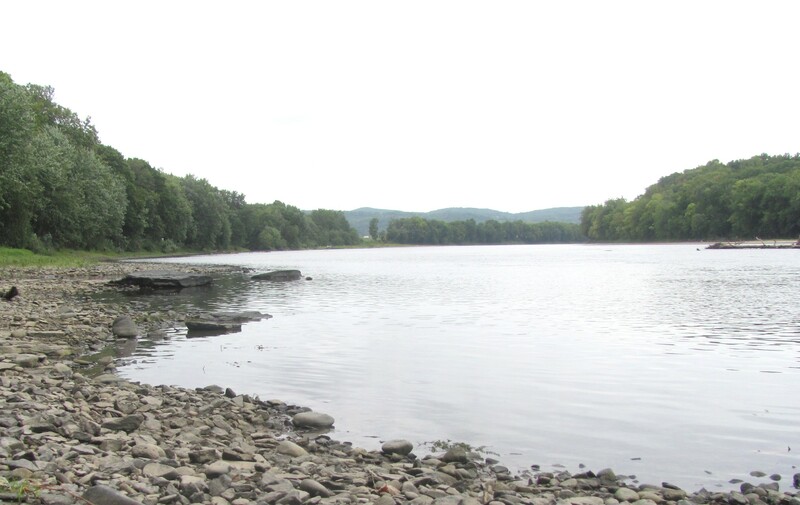 Onheda expressed concerns about the effects of gas drilling and water withdrawals on a waterway that he considers to currently be much cleaner than those in New York. He attempted but gave up jogging along a stretch of Route 187 in Sugar Run because a convoy of water tankers left him no room on the roadway. Many people, including EMHR Greenway Director David Buck and Eaton Township Supervisor Paul Roker provided hospitality for the paddlers, hosting them on private property in Sugar Run and just south of Tunkhannock from Sept. 7 to 10. Edwards and Onheda also visited Wyalusing Rocks and the Wyalusing Valley Museum. As of Wednesday morning, with their camping gear packed in the van driven by Edward’s parents, the two paddlers left Tunkhannock and made their way toward Pittston, where they intended to stop for lunch. Water conditions and stamina easily trump an itinerary set months ago, Edwards conceded, so he has not enjoyed as many opportunities to meet members of the media and residents along the way as he had hoped. To learn more about the sojourn, follow the Onondaga Canoe and Kayak Club on Facebook and www.honorthetworow.com online. For more information on the Nation to Nation exhibit, click on http://content.yudu.com/A30ayl/nmai-summerfall-2014/resources/index.htm?referrerUrl=http%3A%2F%2Fwww.americanindianmagazine.org%2Fabout-us.